We love VSCO here at Mortal Muses. If you’re not familiar with them, they make software that emulates the characteristics of various kinds of film. As someone who shoots a lot of film, I love being able to bring the same sensibility to my digital images, and I’m not alone. You may remember that Debra raved about the VSCO Cam iPhone camera app last year and Lindsey reviewed the VSCO 03 pack for Lightroom. Their new iPhone camera app, called VSCO Cam, came out in early June so I downloaded it right away. Note that is this is an entirely new app, not an upgrade to the old one. And it’s much more than your average photo app, combining an innovative camera, phenomenal processing options and, if that wasn’t enough, built-in access to a stream of tutorials and examples to inform and inspire you. The new camera is beautiful in its simplicity. Its killer feature is that a zoom gesture with two fingers on the screen reveals the focus and exposure points, which can be positioned independently. It’s not the first app to do this, but it’s a great addition to the VSCO app and seems to be becoming a standard feature of camera apps. Tapping on the gear icon at the top of the screen gives you five extra options: Flash, Grid, Big Button Capture, Low Light Boost and White Balance Lock. There’s also a reverse-camera option for taking selfies. Once you’ve taken a photo or imported one from your camera roll, it’s time to process it. The free version of the app has several free presets, but because there was a bundle offer when the app was introduced, I bought the whole set from the in-app store (accessed by tapping on the hamburger menu icon at the bottom left of the screen). The presets include those specifically made for portraits (the G series), more mellow presets (F series), the brighter and warm series (S series) and for those who want more of a film look, the K series (their analog series) and P Series (their instant classic range). You can buy the sets individually, and reorder them as you see fit in the preferences. Preview thumbnails show you how your image will look with each effect applied, and you can also change the strength of the effect using a slider. There are other editing tools including grain, sharpening, contrast, temperature and so forth. The sharpening effect is particularly classy. Once you’ve finished tweaking the image, you can save it back to the Camera Roll or share on various social networks. Overall it’s a very slick app with a fantastic range of options. I’ve had a lovely time browsing the Discover section, which links to example images and tutorials to help you get the most from the various presets, and links to VSCO’s weekly Selects page to see even more gorgeous images that have been taken and processed with VSCO software. Integrating constantly changing content into the app in this way is very clever — and really inspiring. There are a few flies in the ointment. There’s no Android version of the app, for a start. And even if you have an iPhone, some of the editing tools (grain, fill, vignette and sharpening) are available only on the iPhone 5, but not on older models. Moreover, I know I’m not the only one who misses the option of being able to shoot square in the camera. And why is it that VSCO’s Lightroom and ACR presets model specific types of film, but its iPhone app doesn’t? I would love to be able to emulate specific Fuji or Kodak films on my iPhone. There have also been a few teething problems with the app: images sometimes don’t save properly, processing runs slowly for some users, and I had to delete and reinstall the app after a week when it refused to open any more. Because VSCO Cam has its own internal database of images, this meant I lost the pictures that I hadn’t exported to the Camera Roll. And reinstalling the presets was rather time-consuming. But VSCO are aware of these problems and are working hard to solve them, so keep checking in the App Store for updates (the 2.0.4 update, which is intended to fix the crashing problem, has just been submitted to Apple for approval). 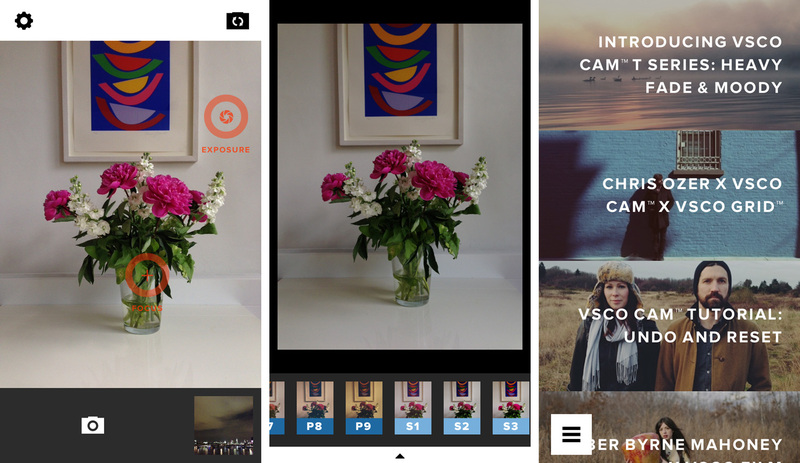 Finally, VSCO Cam has the beginnings of its own social network, an invitation-only community called VSCO GRID. The company claims it is not trying to challenge Instagram, but is instead giving photographers a way to share their pictures with other VSCO users. It’s a bit like an online portfolio; check out some examples. It’s great to be able to see which preset has been used for each image. In all, this completely redesigned app is really impressive, and it also provides a foundation for future expansion. If you’re not familiar with VSCO, then it is also a great introduction to their products. I can’t wait to see what VSCO will do next! 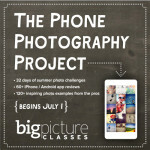 Remember The Phone Photography Project over at Big Picture Classes, where Holly and Jenny are both teaching this summer? You now have the chance to win a spot in the class! All you have to do is to comment on any Mortal Muses post this week; each comment counts as a chance to win. We will draw SIX lucky winners and announce the results next Mobile Monday. If you’ve already signed up for the class, don’t worry; Big Picture Classes will refund your fee if you win the giveaway. I loved the old VSCO app, and this one is even better! Oh, I so wanted to love this app, but I don’t. I do love VSCO and use their LR presets exclusively. And I’d been using the legacy VSCO app for a lot of filters, recently editing an entire set of holiday pics with it (new app hadn’t yet been released). For me though, all this new app provides me is bunch of new filters. The camera is still generations behind other camera apps like ProCamera, KitCam, and Camera+ (KitCam is my current fav) which have features like self-timers and square shooting. And I won’t shoot with a camera that only saves the pics in app for exactly the reason you mention above. I have been experimenting with the filters, bought the whole lot, and I’m really liking the G series presets for portraits. I had hoped they would improve their workflow with this release so that you don’t have to manually import pics from the camera roll. This adds another step to my workflow that’s unnecessary, the app should just have direct access to the camera roll as in the PicTapGo workflow. Sorry to be a VSCO party pooper! Thank you for the lowdown on this app. It sounds right up my street. I have taken the plunge and a new iPhone is winging it’s way to me in the post as I write. I can’t wait to load a whole range of app’s and try a 1001 photography experiments! And if I win a place on the Phone Photography Project my happiness will know no bounds! I see so many amazing images taken with VSCO — will have to try it. Though I have to admit that I am a total PicTapGo fan at the moment, and have deserted my previous favorites like Camera+ and Snapseed. I have a 4s and certainly miss the vignette of this app. Great post, Kirstin! i finally figured out how to adjust the intensity of the effects and i’m a much happier vsco user. about time it caught up with camera + in regards to the whole separate focus and exposure points. The VSCOCAM app is the only one for me, with the new upgrade. Although I have the 4s and do miss the vignette feature. Great article. 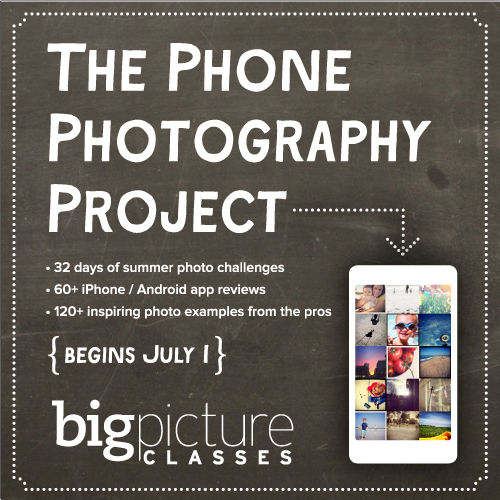 The phone photography project class also looks great. Great review Kirstin. I’m loving the VSCOCam app. I used to shoot in 6×6 the process in the old VSCOCam and now I do it all in the app. I haven’t used anything else since I got it. As for the square thing, I set it to show the 1:1 ratio grid in the camera & use that to compose then when it exports it exports the square image that I composed within the grid. Loving it so far. I have tended to start from P1 or M3 & tweak from there. Looking forward to trying more of the filters. I had no clue about the depth of this app. I had been waiting for your review to dig more deeply in to it all. Thanks for sharing all of this with us. Looking forward to using my new purchase. Have tried several times to register for the class and have failed, so I would love to win it. I downloaded the new app last week and I LOVE it! I’ve decided to take my 365 project mobile for at least the next month so I can really play around. I haven’t even explored the tutorials. Thanks for the great info! Nice to see this. Will have to get to try, why not right?! Thanks for sharing the information here for us. Can’t believe I’ve never heard of VSCO before-I must check this out. I love the new VSCO Cam app – I’m also looking forward to being allowed to create a VSCO Grid when my invitation arrives! love playing with VSCO cam!!! Trying to learn this app. I just bought an iPhone three weeks ago :~) I’ve already downloaded a few photography apps that I learned about from various sources. VSCO was one of them, but I haven’t really used it yet. I had been reluctant to download yet another photo app on my iphone but you just talked me into it:) I will have fun tomorrow playing with its functions I am sure! So many apps, so little time. The summer project class will be a perfect way to try them all out. Thanks for the review!